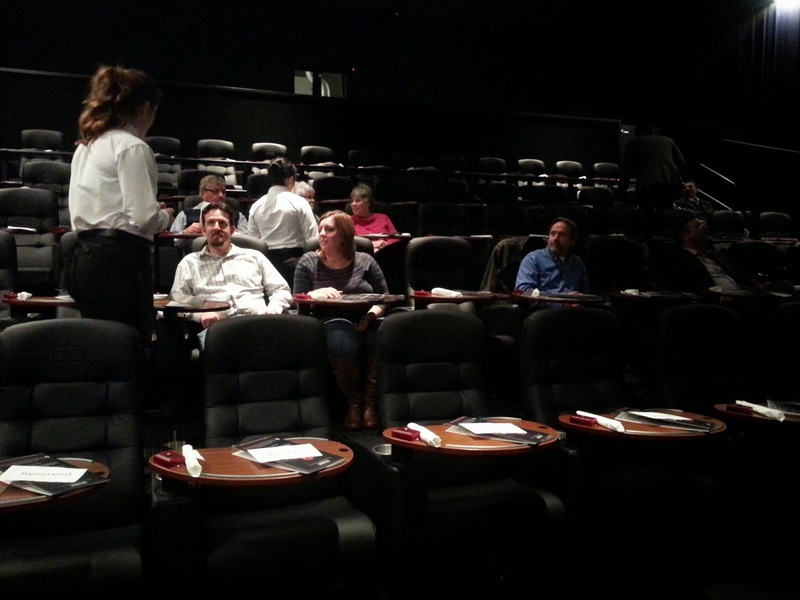 For ages I have been wanting Sacramento to get one of those theaters where you get to dine while watching the movie. I was thinking more like the eclectic places like Foreign Cinema in San Francisco or Five Star Theater in Glendale. 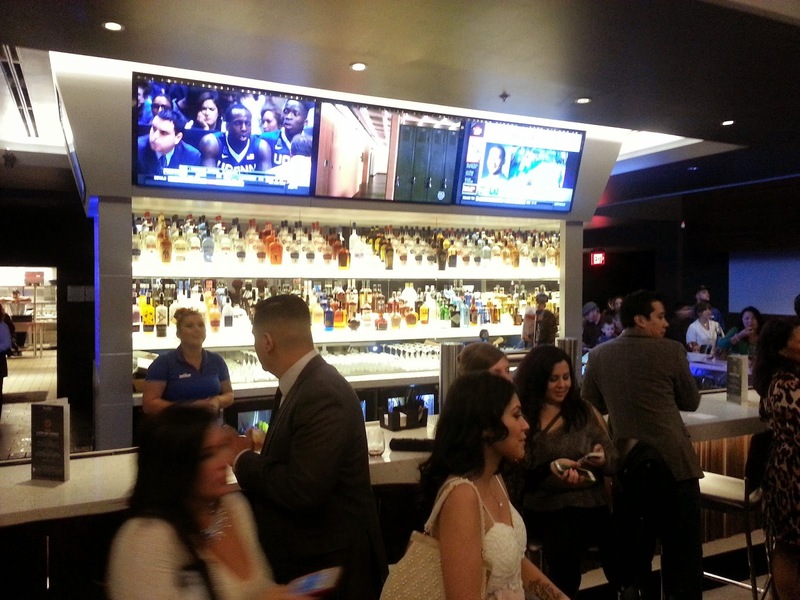 The new Studio Movie Grill has taken the concept mainstream and is opening up theaters across the country. Ours is in Rocklin at I-80 and Sierra College Blvd. 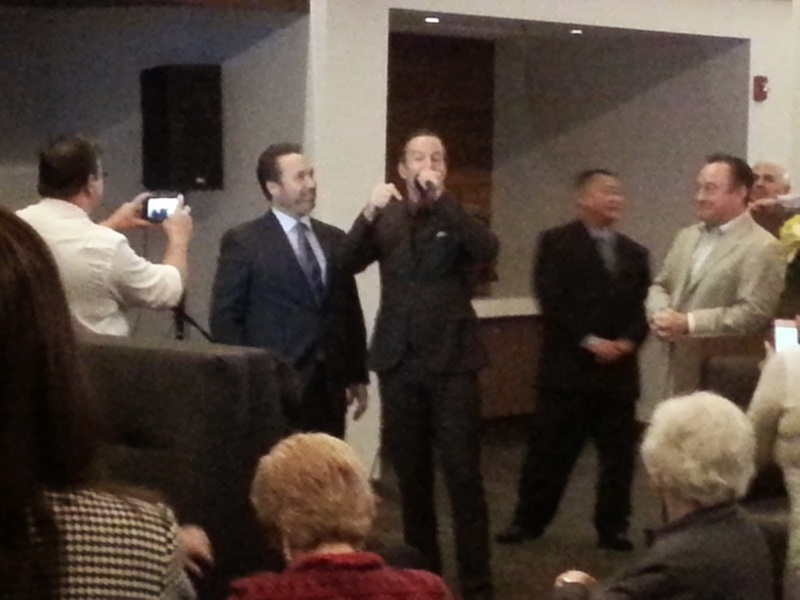 The VIP event was last night and I was lucky enough to be invited. My first surprise upon entering was to NOT see the usual popcorn/snack bar. In fact, there is no snack bar at all. What you do see is a full bar. There's booth tables and bar seating for hanging out and socializing. We were served drinks, appetizers, and there was a small 2-man band playing. Then there was the ribbon cutting with local movie-loving celeb Mark S. Allen. My friend and I chose to see Night at the Museum and got our seats early to snag good center seats. You can see the tables in the top picture that swing out. Each has a "call" button for service. What I really liked was the seating. The seats are large, comfy, and with lots of arm room. There's no fear about knocking elbows or fighting for the armrest with your strange neighbor. There is also a lot of legroom. This is because the servers need to be able to walk to serve you without much danger of tripping over feet or purses. I was also impressed with the menu. It was quite extensive and reasonably priced. A woman next to us summed it up well-- you normally get a large popcorn and a couple of sodas and you are at $12-$20 already. Here you can order a burger for about $10. I'd rather have the burger. The menu had appetizers (and this is where you order the popcorn, btw), salads, sandwiches, burgers, entrees, and desserts (where candy falls under). We were allowed to order an appetizer and entrees. 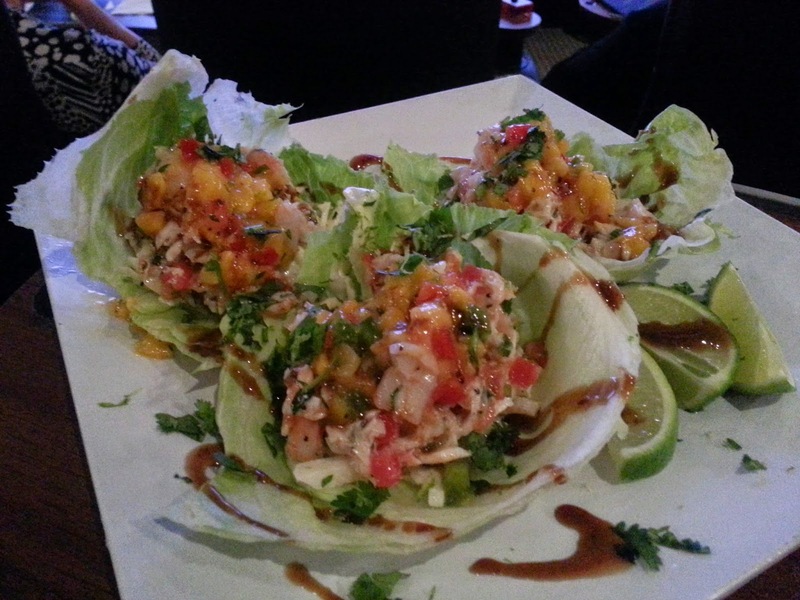 We selected the ceviche lettuce cups for the appetizer and received 3 loaded lettuce cups. The ceviche was fresh tasting and good and the iceberg lettuce was super crisp. I really liked it. I also liked that it and our drinks arrived very quickly - like under 5 minutes. The movie started and it was a much longer wait for our food. For some reason ours seemed to be one of the last served although we were close to the beginning of ordering. I had bbq ribs and fries. Good, but I'm now thinking finger food such as lettuce cups and ribs is kinda touchy for in the dark. My friend ordered the pork chop and ate with knife and fork. My assessment of the food is that it's on par with an Applebee's or a Chili's. It's good, made to order, and a good value. 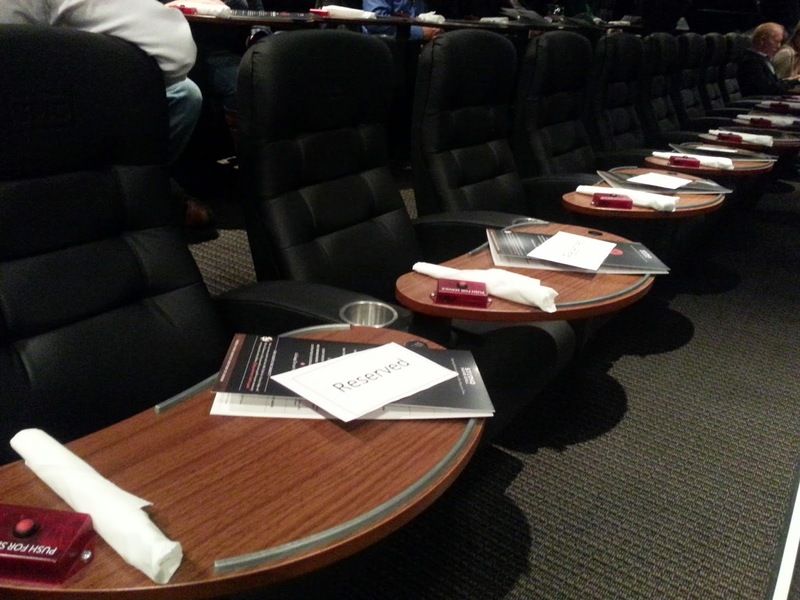 It's nothing fancy, but what do you really expect from a movie theater? I had wondered how it would be to hear people eating around me, but that was a non-issue, at least this time and with these neighbors. You could end up with some slob seated next to you. I also wondered about the servers coming through while the movie was showing. They have to crouch low and do a lot of squatting, but it turned out to not be too noticeable either. As to Night in the Museum? It was nice and cute, but for a comedy, I didn't laugh once. Overall, I'm excited that Studio Movie Grill is here, just that for me it's too far away. Hopefully they'll open another close by someday. I think it's a great option for having the same price movie ticket, better and more food options, and for comfortable seating. Go check them out.